Richter proudly presents its new autumn/winter collection, which offers fashionable shoes, inspired by lifestyle trends made out of high quality materials. 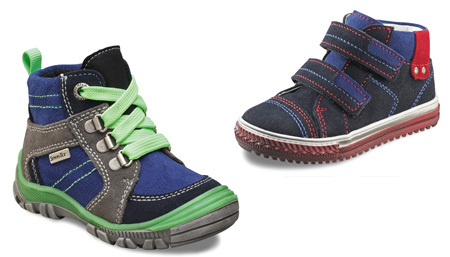 Kids will enjoy wearing our casual, fancy sneakers, with bright colour combinations and smooth leathers in a casual used-optic look.Pasching, January 2013 – Bright colours play a major role in the current autumn/winter season. New: Colours which were just used as accents in the last seasons, turned into basic colours this season. Especially for boys, bright colour combinations place a fashion statement - Richter answers to the customer wishes with courageous designs. Lifestyle fashion of adults – with appropriate interpretation for children. The whole collection aims with reference to adult lifestyle fashion, which is expressed by grown up shoe types. „Kids this nowadays know exactly what they want, they know the fashion trends by heart. Particularly older children (> size 35) want to be stylish and trendy. Kids increasingly want to wear the same fashion as their parents and/or older siblings“ says Alf Netek, CEO of Richter. Still, children should remain fashionably children, therefore Richter puts a lot of playful accents on their shoes, such as colourful interlaces, romantic applications, sporty prints and lots of colourful stitching. Sneaker-Mania, trendy long shaftboots and lace-up boots form a major part of Richter’s Collection Sneakers are a non-controversial leading part of the collection: Boys can choose out of a wide range of cool shoes with bright colour accents which assemble ‘lust for life’ and ‘creativity’. The basket boots are a real must-have! Sneakers for girls are multi-faced with various styles. The inspiration reaches from glitter stars and romantic accents to fancy studs and high fashion leathers. Many of our sneakers have a zipper on the inside, for an easy fitting. 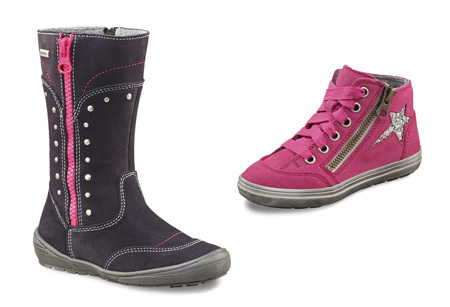 Next to sneakers, trendy city boots for girls and mountain climbing boots for boys are in fashion. For girls we have a variety of boots with a small heel unit and zipper inside. As well as classical, smooth leathered boots. To our ‘girly girls’ we offer romantic embroidered shafts and for the trendy up-to-date girls we offer fancy boots with studs and colourful zippers on the outside. 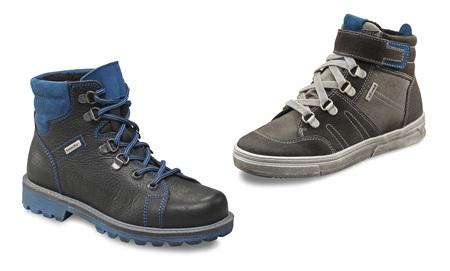 For the adventured boys we offer many lace-up boots with fresh colour accents, visible in shoelaces and outsoles. The uppers are in smooth robust leathers, with a trendy used-look wax finish on toes and heel parts. All of Richter’s City Models are made in high quality leathers. Faithful to the Richter brand credo, the collection sets the pattern for function and quality. Main parts of the collection are made out of smooth nappa leather and suede, some styles have waxed finish as a highlight which give the shoes a trendy used optic and a particular cool look for kids. The classy shoes are made in patent leather and many articles have girly and fashionably patent accents on the uppers. Fashion Leathers complete the big range of materials within the Richter collection. You can hardly call the classic collection the classics anymore. Styles are fresh and fashionable and a must-have for every schoolboy and girl. Richter offers several leather lined, broque-styles with Lace and Velcro options on classic and sporty outsole units in nappa and patent leather. Besides, this trendy sneakers are offered in plain black nappa leather as well. For our prima-ballerina’s we offer a wide, brightly colored range of nappa and patent leather Mary-lanes with girly details of hearts, flowers and bows. Let school begin! !